Featuring a laundry list of maintenance features, System Mechanic is as robust as its competition, but its design may bore some. Modern computer companies, most notably Microsoft and Apple, sell us on their operating systems being as low maintenance as possible. This wasn't always the case: back in the Windows 95 & 98 days, only a rookie wouldn't defragment their hard drive regularly. As the years passed, protecting and maintaining one's computer became a part-time job, and thus an industry was born. Virus Protection become a marquee feature, a charge led by Norton, McAfee and others. 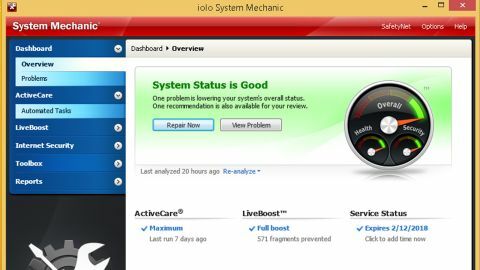 System Mechanic 14.5, which retails for $49.95 US (£33, AU$64), aims to take care of the software upkeep and maintenance that some companies, especially those whose specialty isn't technology, would normally depend on an IT person for. One of System Mechanic's main competitors SlimCleaner (free, and available as SlimCleaner Plus, currently discounted to $29.97 (about £20, AU$38), also boasts that it will speed up your system, but makes no claims to your internet speed. What it does offer, and something that System Mechanic doesn't mention, is increased battery life. According to SlimCleaner support, the difference found in their Plus version is 24/7 support, which includes holidays. It also claims tech support can remotely log into your computer to perform system maintenance, which you yourself can supervise. It should be noted, though, that even though I didn't need iolo's support during this testing, they offer very similar support service. System Mechanic has a very simple interface, and places a diagnosis in front of users immediately upon starting. What you may not expect is the lesson in How Computers Work that you get with each feature. Reviewing your options for saving your computer, each fix is actually explained in uncomplicated language that most can understand. At the same time, not everybody has time for that. A cleaner more modern layout and maybe a simpler mode in which you check off symptoms would be nice; something like "Apps Load Slowly," "Start Up Time," or "Internet Speed." It's not difficult to understand what System Mechanic offers, but not all of their branded features are as intuitive as a layperson might require. System Mechanic is separated out into a list of subsections: Dashboard (where you are given your diagnosis), ActiveCare (automated services on call to protect you), LiveBoost (focused on increasing your machine's speed), Internet Security (which detected that Windows Defender was there for me), Toolbox (more on that in a moment), and a section to get Reports about your system's status. A feature that feels paramount, Total Care, in which System Mechanic runs a diagnostic, repair, cleanup, and security check all with one click, is nested a bit too deeply into the system. Once you're clicking through every single option in the main menu, inside of Toolbox, under "All-in-one Tools" you'll find Total Care, a one-stop function to put System Mechanic to work. When I first loaded System Mechanic, I received a diagnosis of how many important problems my computer had, and how many programs that may not need to be loaded at startup there are. Most of those important errors are the kind that even a power user couldn't detect on their own, so it's good that System Mechanic is there for you to tell you what's up. This software was used on a relatively new computer, the Acer Aspire E15 (featuring a 1.9GHz Intel Core i3 CPU, with internal Intel Graphics, 4GB of RAM, and a 500GB hard drive) that I recently reviewed. What that means for the review is that System Mechanic wasn't necessarily tuning up a computer that had logged months or years of work and had been filled with cruft. Nonetheless, it was still dealing with a machine that came with a lot of pre-loaded nonsense, and with settings set to Acer's liking. Also, no better way to get the best bang for my buck for the E15 which retails for $469 (about £308, AU$601). Once I saw the problems at hand, I approved System Mechanic to process them and get everything right and fixed. It then cleaned my registry, correcting 599 problems. It cleared out 547.40 MB of cluttering files. Not only did it repair my hard drive, but it rearranged 26.42 GB of data so that files could be more easily accessed. The Windows registry was backed up, and thanks to a disk defragmentation, more of the computer's RAM was made available. This process took 57 minutes, and was followed by the first of many necessary system restarts. After I rebooted, I was given a series of "recommendations," basically saying you've done a lot of good so far, and here are ways to get more of your computer's power. Disabling programs that I didn't need to automatically start when the computer boots up was one of the first times I felt extremely pleased with the experience. Then, I went into the LiveBoost section, enabled its features, and after those two processes had been finished, I started to notice an obvious improvement in performance. I started using the computer in practice, and touches and clicks were met with snappier responses. After I had gone through enough of the checklists so that no egregious problems remained, I stopped Chrome from auto-loading and I cut out a series of programs that radioed back to their manufacturers. System Mechanic even alerted me to applications it itself actually installed, not giving their own software any preferential treatment. I really enjoyed that. To get a measure of how efficient System Mechanic has made the E15, I ran two benchmark tests I tried on the laptop during my original testing. On PCMark 8's Home test it scored a 2020 (a less than 2% improvement from the original score of 1987), and in the Work test it scored a 2407 (which is also a less than 2% improvement from the original score of 2372).